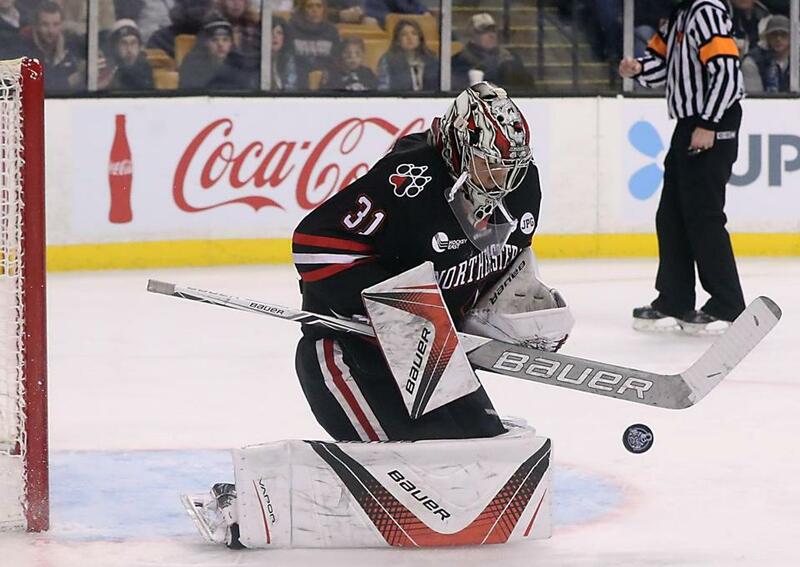 Cayden Primeau is 12-3-1 with a .923 save percentage for Northeastern this season. In the world of college hockey, it’s best not to focus on a single weekend of play, no matter who the upcoming opponent is. Coaches will be quick to remind you that they’re all big weekends. Still, this weekend really does seem to carry an extra bit of weight, as the two teams atop the Hockey East standings will square off when Northeastern and UMass play a home-and-home series beginning Friday night at Amherst, and concluding Saturday night at Matthews Arena. UMass (17-3-0, 9-1-0) continues to roll along in what has been a breakout season. The Minutemen are all alone in first place in Hockey East, and are again ranked No. 1 in the country after sweeping Vermont last weekend. They have already matched last season’s overall and league win totals, and have won three in a row after dropping a 2-1 decision to UMass Lowell in their first game back after the holiday break. Northeastern (14-4-1, 8-2-1) is in second place in league play and vaulted to No. 8 in the country after last weekend’s sweep of Maine in Orono. A Chicago Blackhawks draftee, the 21-year-old is a swift puck-moving defenseman with a team-leading 37 blocked shots. After losing their top three scorers from last season’s squad that went 23-10-5 and finished second in Hockey East, the Huskies were expected to fall back in the pack this year. The trio of Adam Gaudette, Dylan Sikura, and Nolan Stevens combined for 156 points en route to capturing the school’s first Beanpot title in 30 years and reaching the NCAA tournament. Gaudette tallied 30 goals and 30 assists to capture the Hobey Baker Award. All three players turned pro at the end of last season. “We knew we lost three good players, but we knew we had a lot of good players coming back,” said Madigan. “I don’t know if people gave us credit. We had a first-team All-American returning as a junior [defenseman Jeremy Davies], a Hockey East all-star come back as a sophomore [goalie Cayden Primeau]. “We had some forwards that people might not have known, but they had been productive scorers in the USHL and junior hockey and in other leagues. “We knew that we were going to miss the Big Three. We knew that scoring was going to have to be more diversified and spread out. That’s what we’ve been able to get. Madigan points to veterans like junior Grant Jozefek, senior Brandon Hawkins, and senior Liam Pecararo, as well as freshmen Tyler Madden and Jordan Harris, as helping to fill the void offensively. The team is regrouping after the World Junior Championships in Vancouver, in which Primeau and Madden played for the US team, with assistant coach Jerry Keefe serving in a similar capacity for the US squad that ended up taking home the silver medal. Madden was named player of the game after scoring two goals in a 4-1 win over Finland on New Year’s Eve, while Primeau went 4-1 in the tournament, recording 112 saves and posting a .933 save percentage. 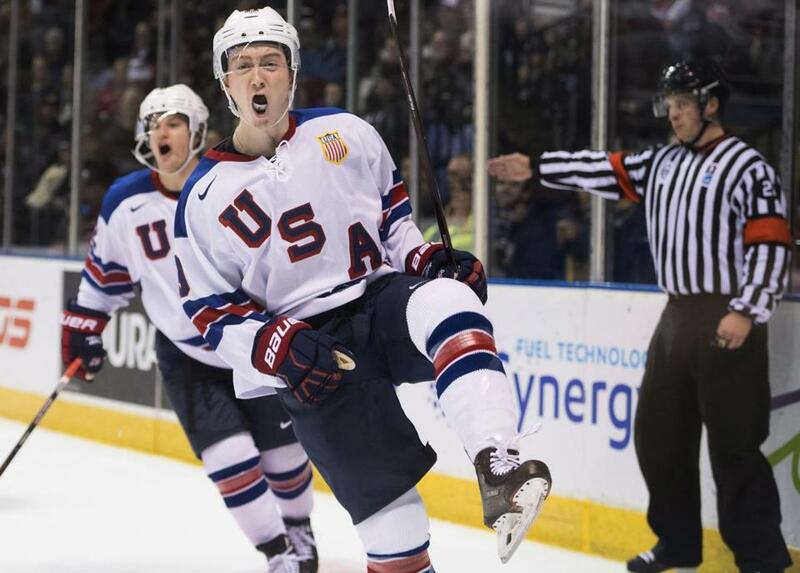 Tyler Madden celebrated after scoring one of his two goals for the US against Finland in the World Junior Hockey Championship. Certainly, playing a short stretch without two of their top players and a member of the coaching staff would present a challenge, but it’s the price of success. 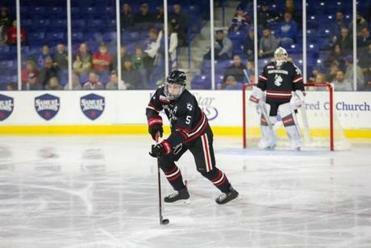 Harvard’s Jack Dury was also on the roster, as was Boston University’s Logan Cockerill and Joel Farabee, and Boston College’s Oliver Wahlstrom. While the tournament was going on, Northeastern had three games on the schedule, winning a pair in the Catamount Cup in Vermont before being shut out, 1-0, at home against Merrimack. “We knew we were going to have to make do without two good players and a coach who has a major impact on our program, but it’s kind of like the Patriots’ motto, a ‘next man up’ situation, and I thought we did a good job managing that, and other guys stepped up in making sure that we played well. Northeastern will need another complete weekend against a UMass squad that looks poised to make a deep run in March and April. Sophomore defenseman Cale Makar (8-16—24) looks to be a legitimate Hobey Baker candidate and will likely turn pro at the end of the season. Sophomore goalie Matt Murray is 14-1 with a .933 save percentage. Carvel believes his squad, which will also play BC and BU twice each in the coming weeks, can be even better. It sets up for what looks to be a pivotal weekend with regard to who will grab the Hockey East regular-season title and top seed for the league tournament.